Diagnostic Imaging Centers, P.A. 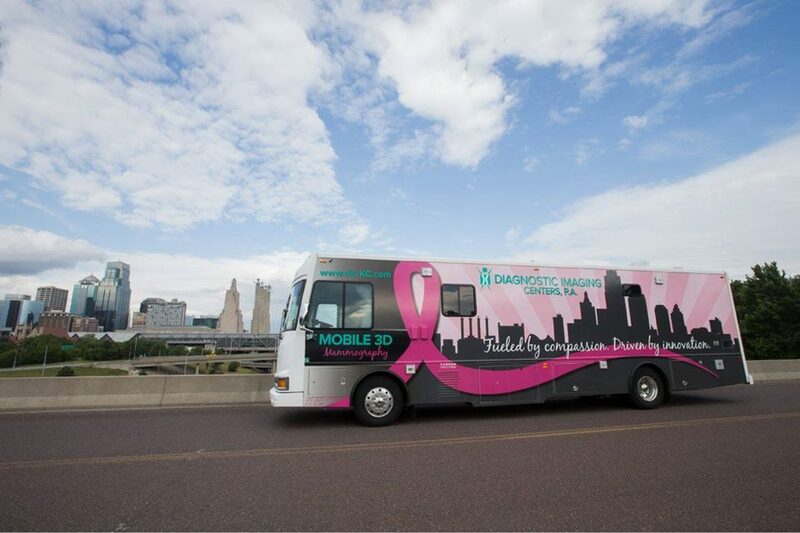 & Susan G. Komen Kansas & Western Missouri have teamed up to bring mobile 3D mammography to Trinity Temple Church of God in Christ! Walk-ins are welcome, appointments are encouraged. •Women 40 years and older do not need a doctor’s order for screening (non-symptomatic) mammograms. •Women 35-39 years old may obtain a baseline screening mammogram. They should check with their insurance provider prior to the screening for plan eligibility and coverage. •You will need your insurance card. A credit/debit card (no cash or checks) can be used for uninsured patients, or if you elect to pay the $55 fee for a 3D screening (if your insurance only covers 2D). •If you don’t have insurance, you may qualify for a mammogram provided by Susan G. Komen Kansas & Western Missouri. •Patients should not be pregnant or be breastfeeding. •The coach is not ADA-accessible due to vehicle parameters. •On the day of your mammogram, please wear a two-piece outfit so you don’t have to fully disrobe and avoid lotions, deodorants, and powders above the waist.